When you ship, you’re depending on the carrier to get your box to its destination on time. While there will always be unexpected delays, there are some things you can do to cut down on that risk. Some of them are similar to the tactics we recommend for reducing lost packages, so to learn more about that, go to Shipping 104. The first issues to avoid are errors and omissions related to the destination address. 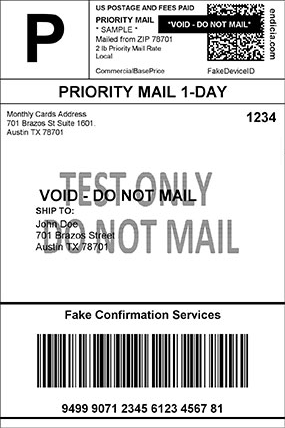 Double-check that the address on the shipping label exactly matches the one provided by the recipient, and include any information you think could be relevant buzzer/ringer number, gate codes, or suite numbers. We also recommend including a contact phone number in case something goes wrong or the courier has trouble finding the destination. That way, you’ll stay informed of issues as they arise, giving you a chance to reach out to the carrier and recipient. 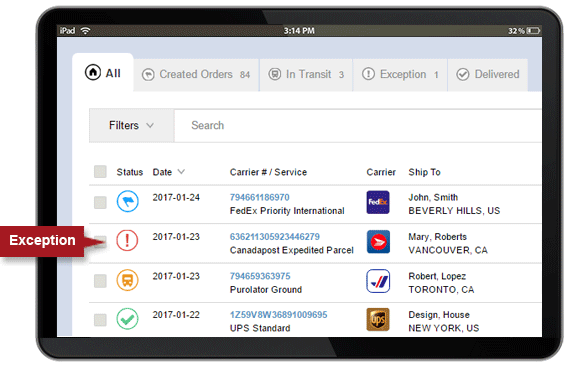 The carriers consider it your responsibility to track shipments and monitor their progress for any issues that may come up. They don’t always call the shipper or the recipient to solve shipment issues. It's hard for anyone to constantly stay on top their own shipments, especially as your volume goes up. We make it easy to keep tabs on your shipping with our tracking intelligence, which flags shipments that require attention. Since post offices are run by the government — Canada Post in Canada or USPS in the United States — packages shipped through other carriers cannot be delivered to PO boxes. If you do ship to a PO Box, your package will be delayed, and you’ll likely pay additional fees. Worse, if the carrier can’t find an alternative address, your package will be returned back to you at your own cost. Each carrier has two distinct types of cutoff times: one for scheduling pickups, and one drop-off box/depot cutoff time. If you’re even a second late when you schedule a pickup, you won’t be able to get it picked up until the following day. On the other hand, the drop-off box cutoff is less exact, and we’ve seen packages picked up 30-45 minutes before the official cutoff time. If your package is time-sensitive, make sure to drop it off with a buffer in case the listed time is inaccurate-we recommend at least an hour. If you’re concerned about a specific shipment, arrange to drop it off at the depot to reduce the risk of delays. While the carriers don’t make their cutoff times easily available, we make things simple here at Secureship. Click this link to find the cutoff times based on your postal code for multiple carriers. Yes, it’s obvious, but a reminder can’t hurt. If you do miss the cutoff, or something else comes up unexpectedly, an extra day or two can give you the cushion you need for things to still go smoothly. There’s nothing wrong with your package arriving a day early. People ship a disproportionate number of boxes during the Christmas season, which also happens to be a time with particularly bad weather. As flights are canceled or delayed, and roads become icy, weather conditions can lead to shipping delays, so it’s an especially important time to ship a day early instead of a day late. Besides, people are more unhappy about late shipments at Christmas than at any other time of the year. The main causes of delays and returns in international shipping are issues with the documents involved. International shipments are generally subject to higher levels of security and control, and mistakes are more likely to lead to problems. Ensure that your box has all the necessary documents and that they’ve been filled out correctly before shipping. If you’re not sure about the documentation found in international shipping, check out Shipping 205. However, there are other aspects of international shipping that can throw off even experienced shippers. For example, US-based carriers such as UPS, FedEx, and USPS won’t ship to Cuba or any other embargoed country. Additionally, some items that can be shipped domestically are either restricted or prohibited internationally, and those rules can vary from country to country. If you’re not sure of the unique requirements of international shipping, Shipping 202 from our Learning Center is a great place to start. If your package is delayed, lost, or returned, the first thing you need to do is contact your carrier. They’ll be able to tell you more about the situation and what happened to your package, but some of the legwork involved in fixing the issue can be left up to you. It’s your responsibility to monitor the delay and call the carrier as soon as you notice something. Not all carriers will contact the shipper or the recipient if there is a problem with the shipment. Carriers generally offer a money-back guarantee on shipping costs in case something out of your control goes wrong with your shipment. However, there are limits and conditions associated with guaranteed service refunds (GSRs) that you should be aware of prior to shipping. If you provided an incorrect address, gave incorrect information on forms for international shipments, or did anything else that could have hindered shipping, you won’t be eligible-that’s why it’s important to double check everything before you send your package. There are some other conditions associated with GSRs, meaning that some delays aren’t covered. Weather conditions, for example, or situations beyond the carrier’s control won’t result in a refund. In order to maximize the chance of a successful claim, you need to ensure that you’ve done everything in your power-if they can find a way to deny responsibility, they probably will. Remember, Guaranteed Service Refunds (GSR) are only money-back guarantees, not delivery guarantees. Even if an important, time-sensitive item is delayed, you’ll only get the cost of the shipping back. The carrier is not responsible for consequential damages caused by a late delivery. GSRs are separate from shipping insurance, as they apply only to the actual cost of shipping, not the value of the contents. For example, if you ship a package where the transportation cost is $10 and it contains an item worth $100, your refund will only be for the transportation costs - that is $10. Insurance is different and often comes with an additional fee; you can find more information on shipping insurance in Shipping 201. Delays are a major problem for any business, but they can be reduced, if not entirely eliminated, by following the guidelines in this article. Some of the most effective ways of reducing delays are also the simplest, such as confirming a correct address and not sending anything to a PO Box. On the other hand, cutoff times, international shipments, and other aspects of shipping can be more complicated but still manageable. No matter how efficient your business’s shipping is, there are some items carriers don’t ship, or only under certain conditions, and some are less obvious than others. Go on to Shipping 107 to learn what you can and cannot ship.